Catherine Nguyen. Neill & Lee Contractors. Closet converted to a powder room. Where is this mirror from? - Love it! Where is the ceiling light from? Where did you get the mirror, please? - And what are the measurements? What did you use to get the golden color on that mirror? Chandelier? - What is the name and manufacturer of the chandelier? i love this bathroom. What is the brand of the toilet? thank you! @camillemassie thank you so much!! It's a Toto. Sink manufacturer? - Hello! I'm adding a small powder room on my main floor and this sink would be perfect for the space i have. Can you share with me the manufacturer? Thank you so much. Did anyone learn the manufacturer on this sink? (Also the dimensions?) thanks! @ vbekris, @baribrooks, @remodelkiawah - sorry for the delay! Thanks for your interest. It's Whitehaus WH1-103L. It is 17.5"W x 8"D x 5.5"H.
sink brand? - what is the sink brand? How many inches wide and deep is the room? I am trying to tuck in a teensy powder room in my house. What are the dimensions of the sink? - What are the dimensions of the sink? @treyampofo Thanks for your interest. It's Whitehaus WH1-103L. It is 17.5"W x 8"D x 5.5"H.
Hi treyampofo! We carry this model and many like it on our webstore for only $111 if you're interested! Dimension - What is the size of this bathroom? Toilet? - Love the use of space! Can you tell me the toilet dimensions or the brand? Whitehaus and Toto whites match up ok? - I have a tiny powder room - already have the whitehaus corner sink and just ordered the toto promenade toilet - in cotton. Was wondering if the toto featured here was in cotton as well and did the whites match up as well as it appears in the picture. Where is the towel bar from? - I own that same sink and would love to purchase a similar towel bar. Thanks! Hi! It's in the previous comments - it's a fun paint color! It's Kendall-Charcoal by Ben. Moore. Thanks for reaching out! Sink - Where is this sink from? The answers are posted in other replies. 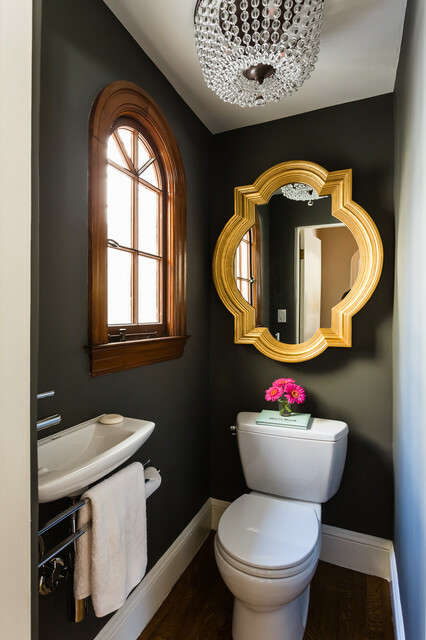 paint color - luv the bathroom! what's the paint color? Hi, does the door swing in or out? - I'm working with a very similar room layout. 48"l x 40"w.
@megfrost this was an old closet so the door swings out. Room dimensions - Can you share the dimensions of this powder room please? Mine looks similarly narrow. Would love to add a sink like this. Thanks! Did you have trouble meeting code with the dimensions of the room? - Did you have to get any variances to pass inspection? @Katie Krejci it's entirely to code and just took a little time talking with the permit desk about how it complies with code. Mirror - I love the mirror, where can I find it? @tiffany_1522 the mirror is from Z Gallerie. Thanks for your interest! Love the light fixture. Can you provide the details? Thanks! Where can I find this towel bar? Paint color - What is this paint brand and color? wall color please - Can you please share the wall color? Towel arm - Where did you get a towel arm that fits under this type of sink? love the gold mirror. what is the brand i.e. where can i buy it. ty! What is the brand of the paint and the color? Light - Where is this ceiling light from? Paint - What color is the paint in this powder room? Dimensions - I have an area that looks similar in size that I'd like to make a powder room. Please let me know the size of the room and distance from the toilet to the edge of the sink. Thank you. mhellkamp - What are the dimensions of the room? Sorry, Mirror? - Mirror thread speaks of paint color. Where can the mirror be purchased pls? Dimensions - What us the sure of this bathroom?